Murder ,weapons and assault charges were filed against six men,Lonnie Orlando Mitchell Jr his brother Louis James Mitchell, Charles Edward Barksdale III, James Leo Carney III, Dominique Marcell Lott, and Larry Dean Jones . 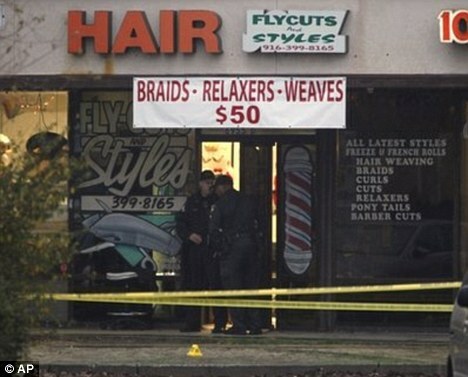 A shootout at Fly Cuts & Styles on Stockton Boulevard in South Sacramento. Two people were killed including a mother who was strapping her son inside his child seat. Monique Nelson who laid her body across during the gun battle. The other victim was Marvion Barksdale. Ongoing bad blood between the two families set the stage for the Dec 14 shootout. According to the Sacramento County affidavit. Lonnie Mitchell has robbed an unidentified Barksdale cousin, and Marvion Barksdale retaliated by thrashing Mitchell in a fight. The two Barksdale cousins, Lott and a woman then swooped into the barbershop with the guns blazing, the affidavit said, while the heavily armed Mitchell’s shot back with hand guns and rifles. Sacramento investigators said ballistics test showed a bullet from Carney’s gun killed Nelson. However,detectives don’t know who fired the shot that killed Marvion Barksdale. According to reports, the Barksdale family in South Sacramento is an infamous crime family(G-Mob gang) that has been active for more than 20 years. Last June, Marvel Barksdale” 17, was convicted of voluntary manslaughter of a shooting that took place in 09 (he was 15 at the time) and received 27 years. Last February, Develle Barksdale” and a female companion, was arrested for credit card fraud outside of Salt Lake City. Sentencing Pending. February of 2009, Charles “Sho” Barksdale was convicted of bank fraud and sentenced to 10 years. Marvel and Develle Barksdale are from South Sacramento however, Sacratomatoville Post could not make a definitive link to the families as of date of this post. This entry was posted in Crime, NATIONAL, NEWS SACRATOMATOVILLE, Uncategorized and tagged "The Mitchell-Barksdale Barbershop Shootout, Barbershop Shootout Sacramento, ca, Charles Edward Barksdale III Sacramento, Crime, Dashawn Barksdale, Dominique Marcell Lott Sacramento, Fly Cuts & Styles Sacramento, James Leo Carney III Sacramento, Larry Dean Jones Sacramento, Lonnie Orlando Michell jr, Louis James Mitchell Sacramento, Marvel Barksdale, Marvion Barksdale, Monique Nelson, sacramento. Bookmark the permalink.